Opening in theatres on August 1st, the newest horror flick from Clive Barker (he who created Hellraiser) is looking likeÂ an equallyÂ gory, if maybe not equally frightening tale of bloodshed and suspense. Adapted from a short story fromÂ Barker’s infamousÂ Books of Blood,Â The Midnight Meat Train is a darkÂ Â foray into the bloody underground of the public transit system. And any good horror film worth it’s screams needs an equally engrossing score to back it up. Lakeshore Records is going one step better by releasing both the score and the soundtrack to the film as separate discs. And though they might have worked well as a two-disc set, each disc holds up on its own. The soundtrack is a 14-trackÂ mix of Marilyn Manson meets Moby… or techno meets Linkin Park-ish beats and digital remixing work on some already relatively heavy songs. Producer and mixer Justin Lassen Â is responsible for all the remixes on the soundtrack and fromÂ the beginning it’s clear whyÂ he was chosen. Incorporating danceable-yet-slightly-creepyÂ beatsÂ and effects into the music here, Lassen has hisÂ finger on the pulseÂ ofÂ the horror movie genre. With eerie chanting in Jason Hayes and Gerard K.Â Marino’s “Nacatl” and approaching train sounds inÂ Apocalyptica’sÂ “S.O.S.Â (AnythingÂ But Love),” Lassen knows when to goÂ for the surprising shock effects and when to back off and let theÂ background doÂ the work. Some highlightsÂ of the album include the sweet Nintendo sound effects incorporated intoÂ Illusion of Order’s “Briton Load” and the extensive use of dialogue in “Dismemberment Express.” For those looking at the soundtrack/score release as a true combo (as I am) LassenÂ cleverly takes a track from Robert Williamson and Johannes Kobilke’s score (“Leon’s Obsession”) and gives it a nice working over, adding heavier beats and a good minute and a half to the song, and discretely placing it in the middle of the soundtrack. Penetrator’s “Scabs” features some impressively restrained beats and a soft (though disturbing) vocal track. Especially cool is the inclusion of the remix ofÂ “End Credits”Â as the finalÂ track on the soundtrack as a nice segue into the score itself (this track is not included on the score, I’m assuming in orderÂ to keep the two albums distinct). After the excitement of the Lassen-produced soundtrack, Robert Williamson and Johannes Kobilke’s score has a lot to live up to, and it manages admirably, providing a darkly ominous landscape of electronic music and piano work. Kobilke has been playing the piano since the age of six and graduated from the Filmacademy Ludwigsburg/Germany in 1999. He recentlyÂ provided a similarly dark score forÂ the horror film Pathology. But it’s his quieter work that really works here, especially in the reflective track “Leon and Maya” that starts out darkly before fading into a gentle love ballad. His co-composer, Robert Williamson has contributed songs to Underword Evolution and score work to Crank. He puts his electronic knowledge to work here in a very metallic-laced score. Listening to the tracks, you can almost picture the grimy subway train and occasionally hear something that sounds like metal on metal (a knife on train walls?) – listen for this in “Retrieving the Camera.” The electronic effects in “I’ve Been Caught” offer a more subtle take on suspense, as the composers take a distinctly “less is more” approach to their music with only a few instruments and a light wind-blowing effect. It’s an impressive score, and joined with the soundtrack it’s an especially intense few hours of music. I enjoyed both albums equally Â and aside from getting a little to heavy on rare occasions, both offer haunting music with a dramatic flair. I think both the composers (Williamson and Kobilke) and the producer/mixer (Lassen) will have long careers ahead of them. 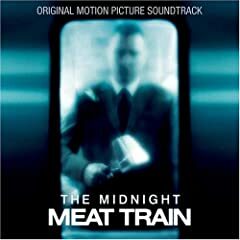 No user commented in " CD Review: The Midnight Meat Train Original Motion Picture Soundtrack and Original Motion Picture Score by Robert Williamson and Johannes Kobilke "